UNP Deputy Leader Sajith Premadasa will present the confidence motion in support of ousted Prime Minister Ranil Wickremesinghe in Parliament tomorrow. 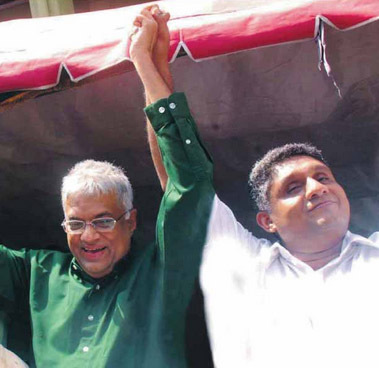 Premadasa’s decision to present the motion is a strong indication that the UNP is squarely behind Wickremesinghe. Sirisena, on several occasions, attempted to appoint Premadasa as the Prime Minister through the back door, replacing Wickremesinghe. Even last week, Sirisena made a desperate attempt to drive a wedge between Wickremesinghe and Premadasa by planting a fabricated story in the Mawbima and Ceylon Today newspaper, owned by controversial Parliamentarian Tiran Alles, saying the UNP leader had promised the Finance Ministry and the UNP Deputy Leader post to Ravi Karunanayake. The UNP expects that 117 MPs – 103 from the UNP and 14 from the TNA – will vote in favour of the confidence motion on Wickremesinghe. The motion will position Wickremesinghe as the Member of Parliament commanding the support of a majority of Parliamentarians in the House. The JVP parliamentary group, led by Anura Kumara Dissanayake, is expected to abstain from voting. The United People’s Freedom Alliance (UPFA) has already decided to boycott parliamentary sessions tomorrow. However, four of the six recognized political parties in Parliament, namely the UNP, the TNA, the JVP and the SLMC, will attend parliamentary sessions and support the Speaker to conduct the proceedings.